Andrew was away yesterday and a package came for him. My curiosity was great, but I left it alone. What else could I do? Tamper with the U.S. Mail? Never. Today, when he got back in town, I had already forgotten about it. So imagine my surprise when he presented me with…. A Julia lunchbox! Just like the one I had in 3rd grade. Wow, he really does listen to me. (Who knew?) I wrote about my old lunchbox here last August. And I suppose I mentioned it a time or two. After all, I was the only student at Winand Elementary with that particular lunchbox. And now, I have one again. Wasn’t it so sweet of him to seek this out and get it for me? Thanks, Honey. I love it! < Where the buffalo roam. I love that Wendy…what I wouldn’t give for a MOnkees lunch box!! what a great reward for not tampering with the mail! and how very sweet of andrew to track it down for you!! The joys of e-bay! I abhor Paypal I refuse to use it and it’s probably a good thing or I’d be spending WAY too much time and money trying to reconstruct my childhood and adolescence. That guy! He’s fantastic … LOVE the lunch box! Man, a lunchbox with Lloyd Nolan on it. How cool is that? who the hell is julia? Now that IS cool…and how nice of him! I am sure I had that lunchbox, too. My mother still talks about it! Maybe I copied you because you were the coolest! 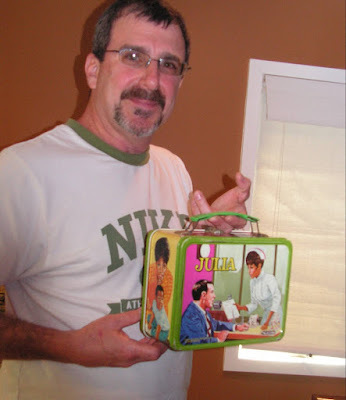 I miss my Partridge Family lunch box!